Even though you can put any precondition in the Definition of READY, the need for a good backlog overshadows all other considerations, so you’ll definitely need to address two items: readiness of User Stories, and readiness of the Backlog. When is a User Story READY? I have found that a User Story is ready when you have answered three questions: Why?, What? and How?, it has been estimated and it is small enough. Why? : What are the stakeholders trying to achieve? What are their goals? What is the business context? What is the Quantified Value? What? : What is the Outcome Vision? What is the end result of the user story? How? : What is the Implementation Strategy? What is the associated cost (story points)? Is the story small enough (story points vs. team velocity)? In the end a User Story is READY if a team can implement it, and a Product Owner can prioritize it. When is the Backlog READY? The backlog is READY when about 1,5-2 Sprint’s worth of User Stories at the top of the backlog is READY, and those user stories are sufficiently small to allow good team flow. Don’t let anything that’s not READY into your Sprint, and let nothing escape that’s not DONE. Serge – Nicely said. I love that mantra “Don’t let anything that’s not READY into your Sprint, and let nothing escape that’s not DONE.” Maybe we will have to print that out and put that above our wall!! 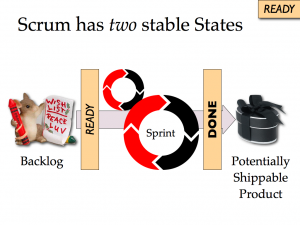 What is the “the dynamic model of Scrum”? And I am a bit puzzled by the phrase “The essential feature was the addition of a READY state”. Are you implying here that the READY state is something new? Because IMHO it is just a recap of “rules” that already existed and are explained very well in CSM trainings (well I can only speak for the one I took 3 years ago) and the scrum books I read. Most people just do not have the discipline to actually follow the “rules” of Scrum and User Stories. But nevertheless it is an excellent summary and I think it is good to explicitly name it the READY state so people get more aware of it. Maybe that will compensate a bit for the lack of discipline…. The picture I put in the blog post is basically what Jeff had as his “dynamic model” slide, but mine’s prettier :-). And of course it’s not new: heck, even the PDSA/Shewart cycle is from the 1920’s… :-). What to my mind is new is exactly the same as what is so powerful about Scrum, or design patterns, or any other popular mental model. It’s a simple (ergo easy to remember) but powerful (lots of positive effect) idea that can be discussed because it got a name. In my case using this idea as a stepping stone it allowed me to find other insights. I’d like to expand on Lars’ comment. What interests me is: what effects does this produce? What kind of team/PO behaviour does it enhance and what does it make obsolete? Could you point to the positive effects more explicitly? And what about negative effects, in other words, what do you lose when making ‘definition of ready’ more explicit? Since I’m writing a series of blogs I’ll get into those issues eventually. To give you a short answer, though, it all came out of my quest for helping Product Owners. Scrum does not support PO’s at all, like it supports teams. The Definition of Ready gives the PO a better focus on what to achieve, like the DoD does for the team. Your question about negative effects I don’t get at all. What would you think you lose with a DoR? Please, find the french translation of your excellent article on La Définition de PRÊT. Regards, Fabrice. Cool, Fabrice :-). Even though I have a french name my french isn’t that good :-). The risk I see with the definition of READY is that we are pretending a frozen requirement. It’s like saying that the user story is frozen, we know everything about it and nothing will change in the future in terms of requirements: the cone of Uncertainty starts already with no variability. What happens instead is that the user story can change for many reasons. The change comes from the PO (e.g. the user experience of a software usually requires to interact with it as a final user before validating the original idea). But the change comes also from the team (e.g. developers) because after initial investigation to find the best implementation or technology the team gives feedback on what is feasible or not. So embrace the change is still the key point for me and it should be part of the u.s. and its estimation. @Edoardo: the definition of READY means readiness for a Sprint, not for evermore, just like the definition of DONE deals with Sprint results, not “frozen results”. So if you say that a user story may not be frozen before a Sprint, I strongly disagree. You must have something solid and stable to go for in the next Sprint. If you mean not frozen in a larger sense, across Sprints, I agree that change can and should be accommodated. But nothing in what I’ve written about READY contradicts that. I find that Serge has done a good job of describing the concept of READY. During 2008 Systematic established the concept of READY, and I will present these expereinces at Agile 2009 together with Jeff Sutherland. The identification of the READY concept came as a solution to flow problems systematically identified with quatitative analysis of Scrum execution. Below you find the links to the article and the slides to be presented. Great article Serge. I do agree with Lars that the concept of “ready” is already part of Scrum but like he said, few follow the actually rules. I also like your point that the PO is often forgot about in Scrum. The PO must “be ready” with no real context around how to define ready in the same way teams define done. This is especially true in large organizations (> 1000) where you may have one chief PO but a whole whack of approvals and other “cooks” who need to get their mitts into the stories. Defining ready sets a proper expectation with the rest of the organization and I think it’s completely reasonable for a sprint team to push back the same way I expect a PO or customer to expect the team to get to done at the end of the sprint based on their committment. Hey Jason, glad you liked it. Even I agree with Lars, for that matter :-). What I have found is that by using the DoR and the Ready Kanban (see the other article) I have two powerful, practical and above all teachable tools that really help a new PO get their act together. Not only that, by giving multiple people filling the PO role something they can organize around they start to show the same self-organizing behavior that you see with Scrum teams. Other advantages have been transparency (“Will the Ready buffer be filled in time?”, “Is there a stuck user story?”) and self-organization across the PO-Team border (“hmm, it’s not very useful if we go fast when we’re waiting for Ready stories. Let’s have one of us help the PO get up to speed…”). operative PO: secures READY and the flow as stated above. Visionary for the platform/product knowing the success factors of e.g. web 2.0. “Are we doing things right?” On site with the team, protects team from customer (disruptions and hiring). Understands business model but cannot propose changes due to lack of industry knowledge. Prioritization based on Cost. Prioritization Based on Value, Cost and Risk is taken from the excellent article “First Things First: Prioritizing Requirements” (http://www.processimpact.com/articles/prioritizing.html). Can you please explain what is “1,5-2 Sprint’s worth of User Stories” ? I mean the number of story points compared to the team’s velocity. For example, if a team has a velocity of 20, you’d want 30-40 points in the Ready buffer by the time you’re starting the next Sprint. I think your definition of “Ready” is wrong. “Ready” happens before the time starts splitting down PBIs into SBIs. You indicate that “Ready” happens right before the Sprint. It’s earlier than that. “Wrong?”. Tsk, that’s so… judgmental. I apparently have a different definition of what Ready means. Ready is – by MY definition – whatever it is that you need before you can go into a Sprint. “Enabling specifications” would then be part of the Definition of Ready. I did a pingback to your post from my Definition of Ready post (above). I really liked it and it helped me to get some of my thoughts around D of R and UX integration (my niche at the moment). Great work! Hi Serge, Over a period of time, the DoR seems to have been diluted and potentially focusing mostly on User Stories. If I understand correctly, DoR is when the team is ready to start the Sprint. The readiness could be the team’s readiness, user story readiness, backlog readiness. Team’s readiness could involve availability of team members, clarity on each other’s roles, dependencies, etc. However, nowadays I see that DoR is mostly focused to see if the user stories are ready. There are no items to check if team members are ready and available for the sprint. Wanted to hear your opinion on the current state. Thanks for the question: it’s something I’ve seen show up a few times the last few months. It’s actually the other way around. The Definition of Ready has always only been about user stories and the backlog, nothing else. I think that this is correct for two reasons. First, like a user story that is too large I could not signal that the backlog is okay because there is some issue with the team. “Team readiness” and “Backlog readiness” are two different things, and I’d want to separate the two. Second and most important, a team’s natural state should be that they are ready for a Sprint. Anything less is an impediment. Putting an impediment like “not everybody is available” on a team readiness checklist automatically means you accept the status quo of unavailability. I would expect something like that on the Scrum Master’s impediments list! Hm, indeed. Thx for the tip. I’ll look into it! How do you define boundary of “How?”. A PO mentioning too much about how may lead him into influencing implementation and too less may lead into a ‘perception’ that the story is not ready. So what defines too much and too less. Also, technical tasks will always have some implementation level unknowns or risks, if I may say. Providing too much of ‘How’ can lead the team into a risk-averse mindset, over a period of time, where they will not be comfortable with even a small amount of implementation level unknown and risk-averse mindset (fear of failure) is not good for agility. Instead a fail-fast mindset is more useful. Is there an objective way to define how much of ‘how’ should be provided by the supplier to the clients for DoR?